Our tiny Sophia with the crazy hair and silly personality celebrated her 3rd birthday yesterday, which also happened to be the largest snow event our area had seen all winter! Even Daddy got to stay home from work and that is a rare occasion indeed. 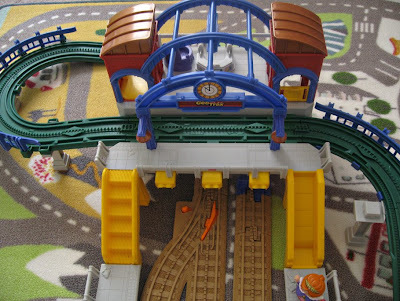 She got a lot of cars and a new GeoTrax train set. 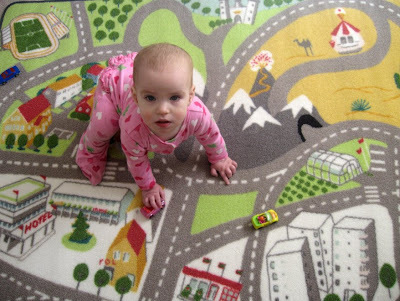 We also bought her this super cool play rug from Ikea. Check it out here. It's was only $14.99 (baby not included) which makes it a great buy on top of being a fun, new surface for the kids to drive their little cars on! I think Sophia gets a bad rap though. 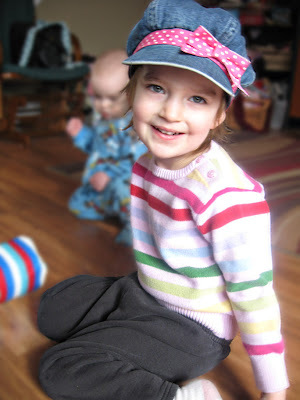 Her sisters will tease her sometimes that she is a boy because she loves what they consider "boy toys". Funny how they forget how much they loved the same things when they were 3! It's also amusing that among all her "boy toys", her favorites included the Knuffle Bunny and accompanying Mo Williams book, her Dora dress-up party outfit with sunglasses, and this tiny sparkly box and felt octopus... all of which she tried to smuggle into her bed with her last night. Her aunt made the box and felt octopus gifts for her! She has many felt creations on her Etsy site, thedotdesigns. Super cute stuff! So, another happy birthday to you, Sophia! Play with whatever you like, my dear. No matter what anyone else says, you'll always be my baby girl!